If you have a small room with no windows and no natural light, you’re more than likely facing the conundrum of how to decorate such a space. Using a paler colour on the walls will help to simulate natural light as the artificial glow will subtly reflect light from every source and help to brighten the room. Consider having a similar colour for the walls and the ceiling to remove any harsh edges. The encroaching walls would no longer be the focal point, but rather the furniture inside. If you have a narrow room, a well-known trick is to have one of the walls a slightly darker colour than the others, to create the illusion of a wider space. 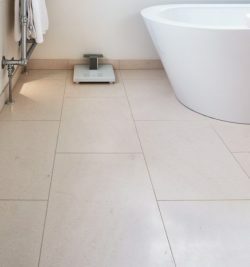 In keeping with a paler colour scheme, stay away from any dark slate and consider flooring such as a light limestone with minimal grouting. If you fear having the same colour throughout your room and would like a splash of something different, try either a green or blue above a focal point, such as a sink or a shower. These colours would bring a more natural tone to the room, helping to counterbalance the artificial light. If your room is dimly lit, this will mean shadows will subdue a lot of the colour; compensate by choosing slightly more saturated colours near your focal points, for a more illuminated space. The more shiny surfaces you can add to the room, the lighter it will appear as they will reflect the light and make the room appear brighter and more spacious. This can range from using gold door knobs and silver frames too, and mirrors. There are tricks as to where to place mirrors to help make the room appear bigger, such as placing two mirrors of the same size opposite each other, or if your room is long and thin, placing a mirror on the end wall. Consider using mirrors as ‘fake windows’, placing them where you’d actually desire the natural light to enter and decorate as such to give the impression that it’s a real window. 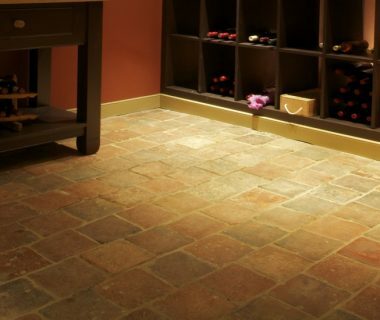 You may also wish to consider flooring and tiling with a slight shine; for example, choosing tiles or a marble surface with a gloss finish will help to further reflect the light. This advice is generally suited to those who wish to counteract the lack of natural light and still create a light and airy room. You could, however, break these rules and embrace the darker, enclosed space. 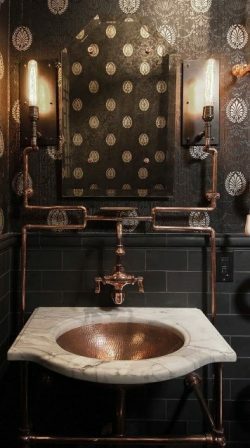 This would create a much more dramatic look and you would effectively make a ‘statement’ room. Don’t shy away from using bold patterns and perhaps still consider using shiny surfaces, such as anything metallic, to keep some light reflecting.